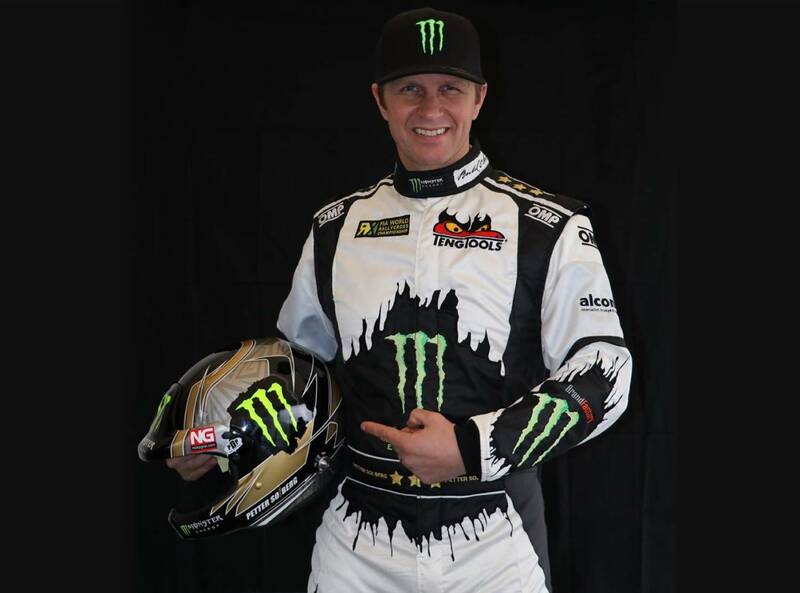 As a part of a new partnership with Stilo Helmets, Petter Solberg and his management team approached Piers Dowell Paintwork, for assistance in creating his new helmet design - celebrating his trio of World Championship titles going into the second half of the 2016 season. Piers contacted us with the request to create a Stilo ST5 Zero Carbon Helmet Design and a Stilo WRC DES Helmet Design - both consisting of similar design specifications that can translate well onto both types of helmet shell. The brief focussed mainly on a gold base, with black and silver combining to make a helmet design in celebratory colours. 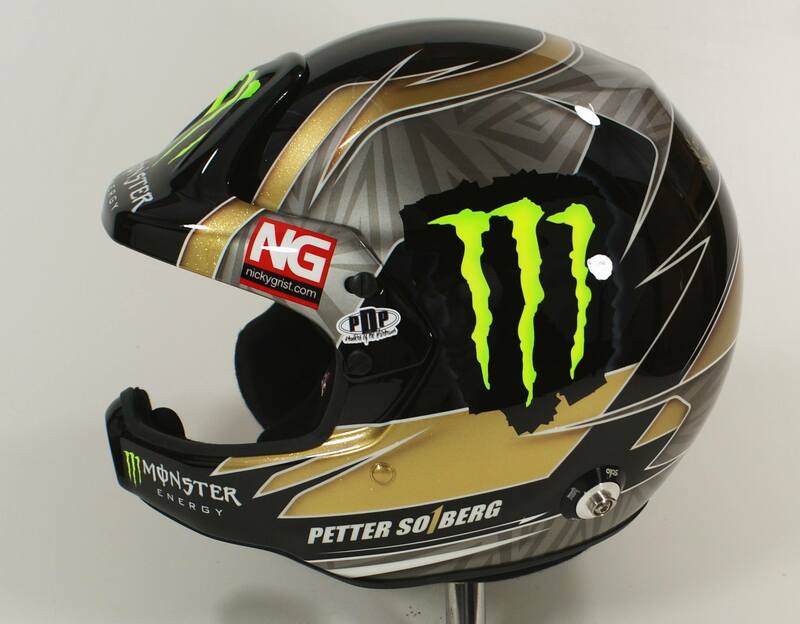 Various concepts were created for both helmet types, as options such as a large Monster Energy claw, use of the Norwegian flag and various shape designs in the side were trialled in the development of this helmet. In the end, the choice was made by Petter and the team to create the main design feature as a large Number 1. 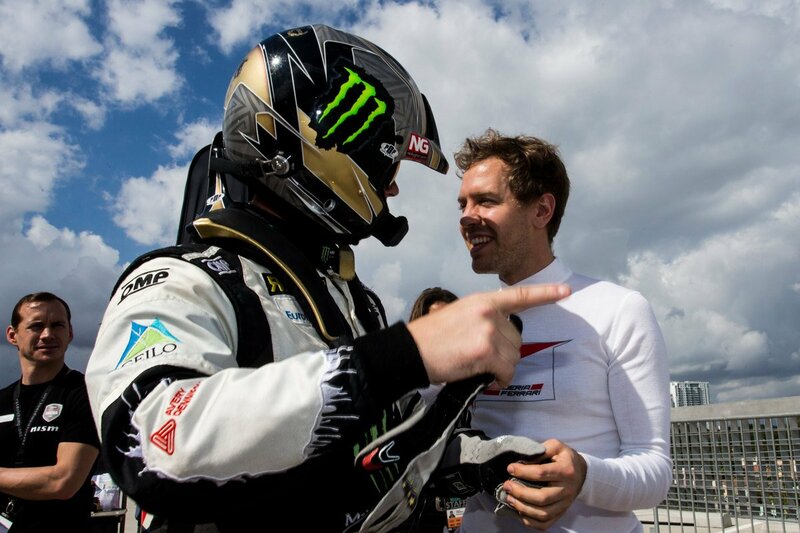 The design was fitted into the Stilo ST5 helmet well, making the gold in the background a strong metallic, as well as the silver being made metallic. Abstract elements were added into the silver to add subtle detailing into the helmet - as what was reflected in his Rallycross Livery at the time. 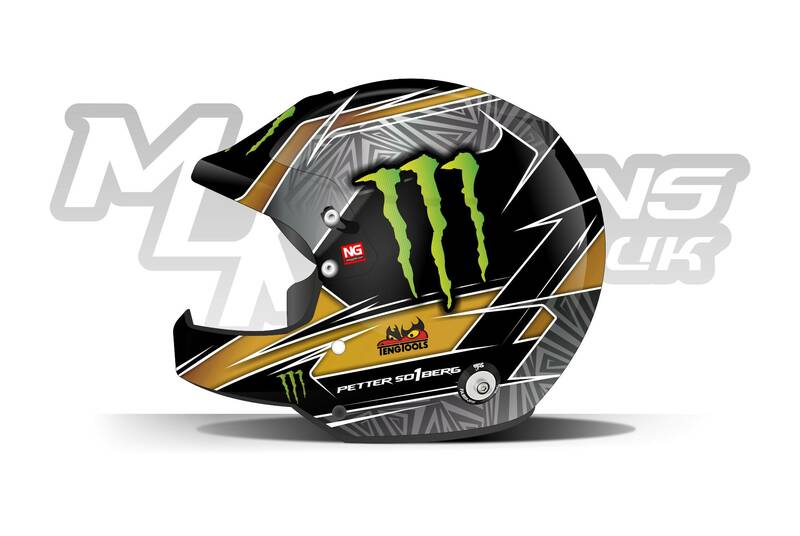 Lastly the Monster Energy logos were added to the helmet to complete the design - as per the final slide in the header slideshow. The Stilo WRC DES version differed slightly from the full face ST5. 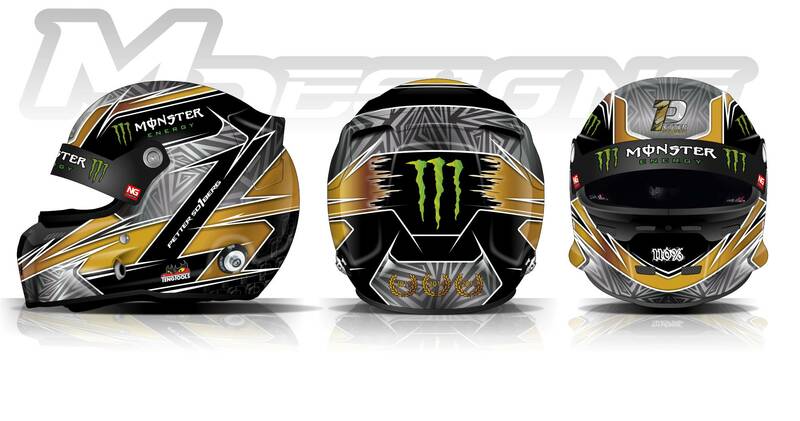 The open faced variant required more emphasis on the Monster Energy logo on the sides. Therefore the logo took centre stage in the side, with the number one forming a connection around the rear of the helmet, which display the trio of Winners Wreaths - for his WRC and WRX Championships, which featured on both helmets. 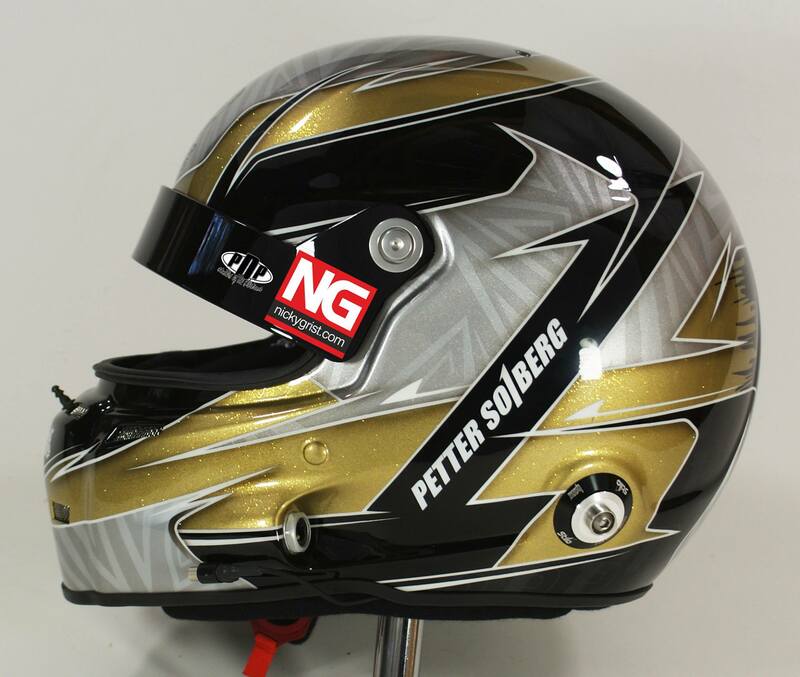 Petter presented the helmet on his Facebook page with a post here, announcing his partnership with Nicky Grist at Stilo Helmets and recognition to Piers Dowell and MDM Designs for the creation of his new helmet. Check out the images of the design and images of his design in action in the slides above and the images in this post.